Leave it to the Catholic Church to dedicate a feast day to an internal organ. A cynic mutter, "What next? The Blessed Toe? The Immaculate Hangnail? The Miraculous Gall Bladder?" Such utterances notwithstanding, today marks the Church's celebration of the Solemnity of the Sacred Heart. Although understandably neglected by most of us - no children, after all, get an annual Sacred Heart vacation - it may be worthwhile to spend a few moments considering what it means to observe this solemnity so dear to the Society of Jesus. The symbolism of the heart is hardly foreign. Top-40 songs croon melancholically about the "broken heart." Students feel devastated when the college they had "set their heart on" sends them a rejection letter. As loved ones struggle with an issue, one feels "heart sick." In the Scriptures, "hardness of heart" prevents Pharaoh from allowing the Hebrew people to leave Egypt and keeps the crowds gathered around Jesus from accepting his message. The heart encapsulates so much of what is essential to our humanity: love and fear, hope and doubt, sorrow and joy. The heart, so to speak, makes us vulnerable to the world. Corporations and young lovers grasp (and frequently exploit) this vulnerability. In the weeks leading up to Valentine's Day, one finds an endless array of heart-shaped boxes filled with various delights. We are encouraged to buy bags of heart-shaped candies stamped with "Call Me" and "Be True" and "Kiss Me." A young man carves his initials along with his beloved's into the bark of a tree; a little boy, wanting to do something nice for his mommy, uses safety scissors to cute a heart from construction paper and writes "I Love You" in a barely legible scrawl no mother can fail to understand. Furthermore, we hear frequently medical advice about good heart-health, about maintaining cardiovascular fitness: heart disease continues to be a leading cause of death in our country. Our language is saturated with these medical metaphors: to gauge vitality we "take its pulse" and if we "call the code" it means that there's no hope, that the endeavor is over. What has this to do with the Sacred Heart? Everything. This Solemnity reminds us that Jesus' heart was nothing less than fully human, open and susceptible to the world around him. Jesus' heart could be scourged with grief - he wept over Lazarus's death - and gripped with fear as in the Garden. His heart moved with love for the Rich Young Man and led him to preach and to teach, to act and live in a way that gave those around him hope in God's Kingdom. His lifespan was measured in heartbeats, a rhythm animated by a heart knitted together in Mary's womb, a heart that must have seemed to have carried the weight of the world within it. And this rhythm of loving and serving and calling led him, ultimately, to the brutal timbers of the Cross. For this is a heart abandoned by those he called his friends, the heart of one whose final words echo within our own hearts: My God, my God, why have you abandoned me? Yet this is a heart, so set aflame by God's life and love, that not even death could extinguish it. The Risen One didn't have a vengeful "heart-to-heart" with his betraying disciples; instead, he bid them peace, shalom, and gave them a new mission. Jesus' heart is sacred not because it is magical but because it focused exclusively on one end: the love of God. Jesus' heart is sacred because Jesus focused his entire self upon bringing into a world grown dark with sin the light of the Good News. Jesus, enlivened by a heart quickened by the Good News of what God is doing, never said, "Change so that God can love you. Change so that God might find something within you to love and then maybe you'll find healing." Jesus flips such a sentiment - sadly one far too many of us share! - on its head: "God loves you, so live out this love boldly. Take heart, my friend, and follow me." Jesus does not ask us to be different persons. Instead, Jesus gives us a way to be be people differently. We are all offered, daily, an opportunity to make our own the Sacred Heart of Jesus. A heart committed to love rather than hate, forgiveness over vengeance, peace instead of war. We might see our lives as the circuit-training of Christian discipleship, a workout program sustained by God's Word and Flesh, aimed not at beach-worthy bodies but Kingdom-living hearts. Christian faith hopes that on our last day Jesus will ask us not about our waist size but about the size of our heart. Did you give me food to eat and water to drink? Did you clothe me when I was naked? Did you visit me in prison? In the hustle and bustle of your daily life, did you allow your heart to be moved in love and compassion? Did you bother to love? In the Sacred Heart of Jesus, Christians believe, we encounter the fulfillment of humanity's hope for God and God's hope for humanity. We are each offered a share in this heart, a chance to make our hearts beat in time with Jesus' own heart. 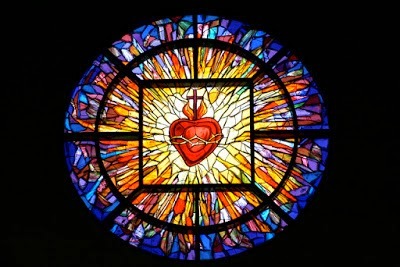 And, unlike the clothing at Abercrombie & Fitch, the Sacred Heart is available to all regardless of size or shape. A heart on fire with a desire to share the Good News with a world desperately in need of it. A heart vulnerable to the cares others. A heart open to being touched, pierced, and moved. A heart pouring itself out in joyful love, giving without ever counting the cost, courageously allowing each heartbeat the record a life lived for God's greater honor and glory. Oh, Sacred Heart of Jesus, give us strength to allow our hearts to beat in time with yours that our entire lives may become one single prayer lifted up to you.